This antenna adapter lets you connect an aftermarket receiver to the factory antenna cable in select 2007-08 Audi, 2008-up Mercedes-Benz, and 2009-up Volkswagen vehicles. The adapter has an OEM female plug on one end and a Motorola male plug on the other. Installation note: A blue wire is attached to the antenna adapter. When installing the adapter, the blue wire should be connected to the antenna turn-on lead of your new car stereo. Please check the stereo's manual for more information. Warranty: 60 days. Does what it's supposed to do and fits like it should. Why do I still get static in almost all my radio chanals and I still using a amplified adapter? I have the same problem; all my connections are made as the instructions stated and I've never had good reception. Unfortunately, I've never been able to figure this one out. My Sportswagen has two antennas (glass and whip antennas) with two cables and connectors that are keyed slightly differently. Does this green dual-antenna connector definitely have the proper keying notches for these two inputs? 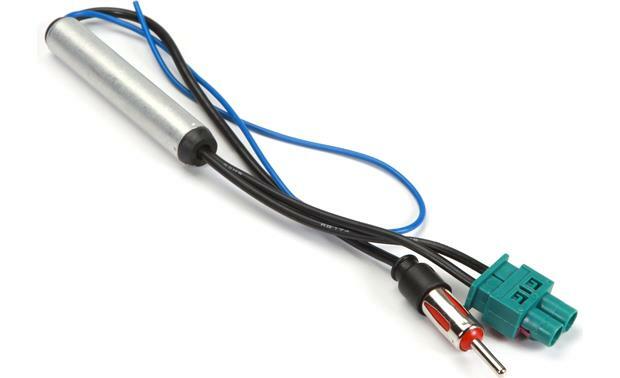 Did you connect the blue wire power antenna to the other blue wire for power antenna. I was getting status too and I didn't connect those wires because I really don't have a power antenna but I connected them just for fun and the static was gone. Searches related to the European Antenna Adapter Works with select 2007-up European vehicles (Motorola male to OEM antenna female).